"The Marching Morons" was originally published in the April 1951 issue of Galaxy Science Fiction. "The Marching Morons" is a science fiction story by American writer Cyril M. Kornbluth, originally published in Galaxy in April 1951. It was included in The Science Fiction Hall of Fame, Volume Two after being voted one of the best novellas up to 1965. The story follows John Barlow, who was put into suspended animation by a freak accident involving a dental drill and anesthesia. Barlow is revived hundreds of years in the future. The world seems mad to Barlow until he discovers the 'Problem of Population': due to a combination of intelligent people not having children and excessive breeding by less intelligent people and coupled with the development of more sophisticated machinery that makes it less important to possess intelligence in one's working life (see Fertility and intelligence), the world is full of morons, with the exception of an elite few who work slavishly to keep order. Barlow, who was a shrewd real estate con man in his day, has a solution to sell to the elite, in exchange for being made World Dictator. In the "Introduction" to The Best of C. M. Kornbluth, Frederik Pohl (Kornbluth's friend and collaborator) explains some of the inspiration to "The Marching Morons". The work was written after Pohl suggested that Kornbluth write a follow-up story that focuses on the future presented in the short story "The Little Black Bag". In contrast to the "little black bag" arriving in the past from the future, Kornbluth wanted to write about a man arriving in the future from the past. 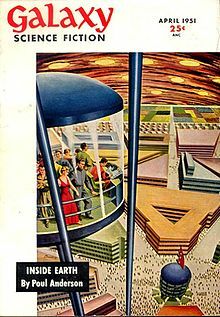 To explain sending a man to the future, Kornbluth borrowed from David Butler's 1930 science fiction film, Just Imagine, in which a man is struck by lightning, trapped in suspended animation, and reanimated in the future. In "The Marching Morons", after the character John Barlow is told how he had been in a state of suspended animation, Barlow mutters, "Like that movie." The human population is now 3,000,000 highbred elite and 5,000,000,000 morons, and the "average" IQ is 45 (whereas now an IQ score of 100 is average, by definition). Several generations before the onset of the story, the small number of remaining 100-and-higher-IQ technocrats work feverishly to keep the morons alive. Propaganda against large families is insufficient, because every biological drive is towards fertility (the story predates the development of hormonal contraception). The elite have tried everything rational to solve the population problem but the problem cannot be solved rationally. The solution requires a way of thinking that no longer exists – Barlow's "vicious self-interest" and his knowledge of ancient history. Barlow derives a solution based on his experience in scamming people into buying worthless land and knowledge of lemmings' mass migration into the sea: convince the morons to travel to Venus in spaceships that will kill their passengers out of view of land. The story predates the moon landing, and the safety of space travel is summed up in a description of a rocket that crashed on the moon. Propaganda depicts Venus as a tropical paradise, with "blanket trees", "ham bushes" and "soap roots". In a nationalistic frenzy, every country tries to send as many of their people to Venus as possible to stake their claim. Barlow's help includes using his knowledge of Nazi Propaganda tactics: postcards are sent from the supposedly happy new residents of Venus to relatives left behind, describing a wonderful, easy life, in the same way as fraudulent postcards were sent to relatives of those incinerated in the Nazi death-camps. But Barlow is duped by his erstwhile assistants. Barlow does not realize that the elite despise him as they despise all people from the past for having not solved The Problem earlier. In the end, Barlow is placed on a spaceship to Venus to share the fate of his victims. The 1954 novel Search the Sky, a collaboration with Frederik Pohl, uses the same plot idea in the last section. The 1987 film Robocop adapts the gameshow catchphrase "Would you buy that for a quarter?" but modernises it to "I'd buy that for a dollar!" The 2006 film Idiocracy borrows the idea of the world population becoming moronic through the stupid breeding more, but it does not have genocide or a super-clever elite. Efim Hawkins: A potter owning a shop near a lake. Often goes for walks through the woods while waiting for his kilns to cool. An "all around man". Reanimated Barlow with 60cc of "simple saline in the trigeminal nerve". John Barlow: A real estate agent from the past (1988). Put in a state of suspended animation after a freak dentist accident involving an electrical shock and the "experimental anesthetic Cycloparadimethanol-B-7" (known as "Levantman shock" in the future). Ryan-Ngana (Hawk-faced man): Meets with Tinny-Peete and Barlow. Pohl, Frederik (1976). "Introduction". The Best of C. M. Kornbluth. New York: Taplinger. ISBN 0-8008-0723-5.